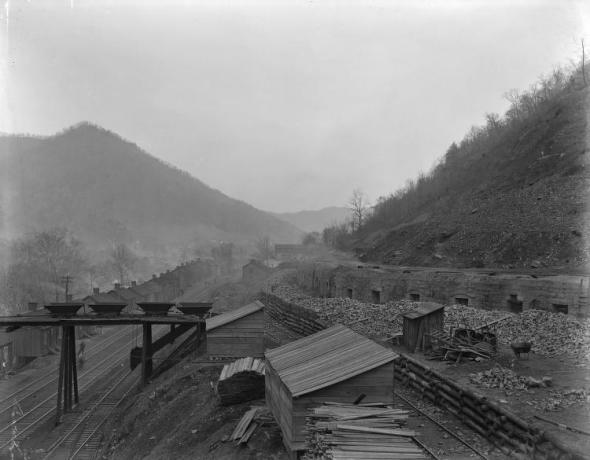 A few months ago, when the West Virginia mining disaster happened, she talked about it in her blog, and I made a comment or two on that post. I mentioned that I’d had at least one relative who worked in the coal mines of western Pennsylvania. I knew several more had worked in the steel mills – not just generations ago, but in my father’s generation and also in mine. In the time since Laurie made that post, I’ve immersed myself in researching my family tree. And wow, did I ever underestimate the head count on family members of mine working in the mines and mills. Of course, in the late 1800s and early 1900s, mining and mill work was a huge sector of our economy, so it completely makes sense that so many of my ancestors would have been in this line of work. I found this information in my research, though, and it blows my mind. It also has forever changed my perspective on what constitutes a “bad day at work” or a “bad job.” It’s an obituary for an ancestor of mine and was published in the Daily Courier, a newspaper in Connellsville, Pennsylvania, on March 4, 1913. Lewis Daniel Cobaugh, youngest son of the late Charles P. Cobaugh, the veteran Baltimore & Ohio engineer, and Rebella Parks Cobaugh, was almost instantly killed about noon yesterday at the Western Maryland railroad coaling station at Rockwood. The cable on the hoist used in lifting the coal to the chutes parted, and a bucket containing a ton or more of coal descended, and pinned the unfortunate man between the timbers and the bucket, crushing him in a horrible manner. The remains were taken to a local undertaking establishment and prepared for burial, and later were taken to the home of his mother. The deceased is survived by his aged mother, who for the past year or more has been rendered almost helpless by reason of a stroke of apoplexy. His widow, who was Miss Ella Williams, and two children, Grace and Annabel, age six and three years respectively, survive. He is also survived by one brother and three sisters. About 22 years ago the father of the deceased, the old engineer, “Dad” Cobaugh, as he was so familiarly known, was blown up in a locomotive explosion, and the injuries received resulted in his death. Prior to death of the father, the oldest son, William, while making a coupling in the Rockwood yards, had his head crushed by projecting rails on two loaded hot cars, dying in a few weeks after that accident. Next, Charles, a younger son, while working in the B. & O. shops at Connellsville, was stricken with malignant typhoid fever, expiring in a few weeks. A few years ago, another son, a flagman on the B & O, was pinioned by a sideswipe wreck in his caboose, directly alongside of a demolished engine, and was scalded to death. I’m not sure what to be sad or shocked about more. The way Lewis died? The fact that he left two little girls behind? Or the fact that nearly everyone in his immediate family tried to do honorable work and paid for it with their lives? I’d been planning a post here to talk about my ambivalence towards labor unions – at least, some of the unions in existence today. I’ve had bad experiences with some of them in my own career, and in Chicago, unions get in the way of employees and their well-being more often than they help. But we’re living during a time when we turn on the TV and see the horrifying BP mess every night. And that drives home a message that corporations don’t, as a default setting, put people first. I’m reminded why unions came to be in the first place, and why safety and security have to be part of any workplace. And the next time I’m having a bad Monday morning, with an inbox full of mail and a dull nagging headache, I’m going to think of these guys, and be damn glad I’ve got a job – and a safe one. 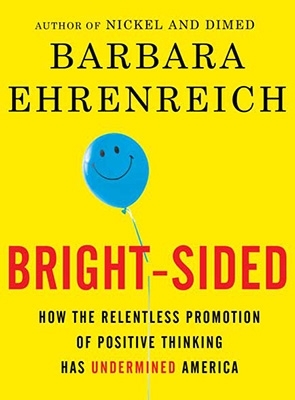 A few months ago, I read Bright-Sided, the latest book by Barbara Ehrenreich. Ehrenreich is a great writer – she also wrote Nickel and Dimed, a must read for anyone in the American workforce today. In Bright-Sided, she rails against what she feels is a “relentless promotion of positive thinking.” I completely get her point here: in the last few years, “positive thinking” has become, in some ways, its own religion. The huge success of the book The Secret is but a small part of this trend. It’s a new book, though a concept like imagining your success has been around for centuries and was a tenet of Wiccan ritual. Business books have been filled with this kind of don’t-let-the-dark-clouds-in mentality for decades. And even religious figures have co-opted this line of thinking; Joel Osteen’s church focuses on positive thinking and the idea that God rewards your positive thoughts and makes you wealthy. Ehrenreich’s most compelling statement about this trend relates to her own life. She was diagnosed with breast cancer, and went online to find resources about the disease. She sought support from other women online. Her hope was to find a space where she could express her feelings and fears honestly and where she could ask questions about what was happening to her and why. What she found was a community that celebrated “the gift of cancer” and a world filled with pink teddy bears. Everyone copes in their own way, of course. And I get her frustration. When she tried to talk candidly about her fears, she was told to think positive; when she challenged that wisdom, she was shunned by the community, who didn’t want her ideas to cloud the space they’d made for themselves. Ehrenreich makes a great case against mindless optimism, born of blind faith and in the absence of logic or reality. She suggests that realism – a balanced view of the world that acknowledges genuine, organic positives and negatives – is the best way to go. Here’s the thing, though: I really believe positive thinking and a positive, supportive atmosphere can make a difference in people’s lives. It certainly did in mine. I was a creative kid with a streak of eccentricity and a vivid imagination. (Yeah, I know – some things never change.) I grew up in a fairly traditional atmosphere, and I was very different from the friends and family that surrounded me. Out of what was undoubtedly great love and concern for me (mixed with their own fears), most of the people in my life tried to encourage me to follow a traditional path, and didn’t respond in a positive way to those head-in-the-cloud ideas. Several years ago, I moved to the Midwest and met a few friends that changed my life. They weren’t members of a self-help group or a cult, nor did they change my life in any organized, structured way. I don’t mean to make these specific people sound like magicians (though I am grateful to them). I’m simply trying to illustrate that the narrative I heard from others (and in my head) changed. Did it work? Well, the growth in my life in those years has been immense. I’d put my efforts at writing on the shelf in my 20s, after college ended. But in 2005, a few years after my move, I started getting my work published. I was asked by the local newspaper to create my own blog in 2007. The year after that, I was a full-time writer and my work was appearing…well, everywhere. (Including here.) And oh yeah, I met my soulmate and partner….who literally walked into my life. I understand why Ehrenreich isn’t a fan of mindless positive thinking. It’s a tricky balance, after all. (Anyone who’s seen the initial auditions of American Idol has seen people who were encouraged to do something that they never should have been!) Not everyone is meant to be an astronaut, or a figure skater, and all the wishing in the world won’t make it so. 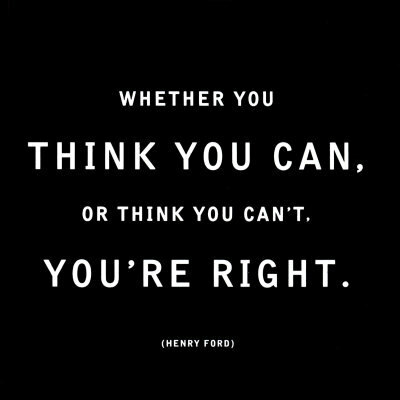 But I think positive thinking CAN be a valuable tool. It often takes years to see results, and it requires thought and analysis along the way. But for many people, fear and negativity defeats us before we even start. Letting go of the fear, and allowing yourself the chance to fail, to learn and perhaps, to win can be scary. But I believe it’s so worth the effort. 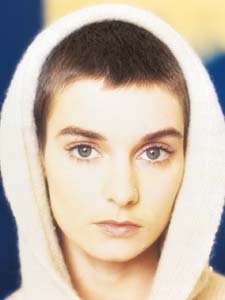 There were few places I went as a college student in 1989 that didn’t have Sinéad O’Connor as a soundtrack. Her debut album, The Lion and The Cobra, had just been released a few months before. Songs like “Mandinka” and “Put Your (Hands On Me)” were a great mix of alternative, hip-hop and dance music, and more than a few of us exorcised our romantic demons with “Troy” playing in the background. Sinéad became a household name after the enormous success of her 1990 album I Do Not Want What I Haven’t Got, with her classic take on the Prince-penned “Nothing Compares 2 U.” If she wasn’t getting attention for her phenomenal music, she was getting attention for her appearance – her shaved head, a big middle finger to an industry that wanted female artists to be tarty and marketable. The reaction was immediate and ferociously negative. 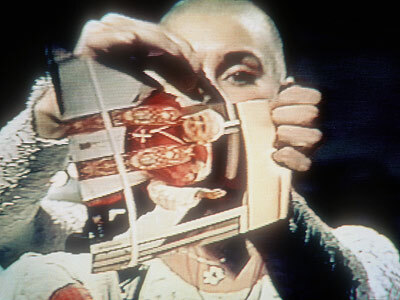 Thousands of people attended rallies where copies of Sinéad’s albums were burned. Her career was burned, too, and her popularity in the United States took a permanent hit. At the time, very little was made of the reason that Sinéad gave the press for her actions: she was protesting the Catholic Church’s handling of sexual abuse that had happened in the church. Children had been abused by priests. It was, perhaps, a relatively new concept in the media, a new concept to readers and viewers. We hadn’t heard much about the events she was speaking about at that time. Her actions were remembered, but the more complex reasons behind them were not. She was often vilified as being anti-religion and anti-Catholic, when in fact her faith was so deep she eventually became ordained as a priest (in an offshoot of the Church). The great irony of all of this is, of course, that the abuse scandal that Sinéad reacted to (in Ireland) was only the tip of the iceberg. The Catholic Church has clearly had issues with abuse – and its subsequent handling of such abuse – and it wasn’t limited to one country or even one continent. Or one decade, since the problem seems to have resurfaced time and again. Sinéad may have been impetuous, or impertinent. She may have even been guilty of a grand, ineloquent gesture. But there’s no denying it: Sinéad was right. Her career as originally conceived and launched in the States is no more, though she’s released dozens of albums since. I still love her music, and her voice is even better with age. She’s been recognized for her work and is still active in matters of faith. I just wish that somehow, Sinéad could be more fully acknowledged for what she did and said – and what she risked to say about a people and a community that she loved. EPILOGUE: After decades of secrecy, Pope Benedict issued what is an astonishing apology just this past week for the abuses that have been committed by priests. It’s long in coming – perhaps too long for some victims – but it’s a very real beginning to healing and making the Church a stronger community. The idea for this post has been growing in my mind for a few months, since the latest round of revelations in the States regarding the abuse scandals in the Church. I came to this idea on my own, but after Googling this topic, I’m both glad – and sad – to see that I’m hardly the first person to say “Sinéad was right.” There’s about a dozen or so Google hits that say similar things, including an excellent piece by now-ABC reporter Jake Tapper that was published on Salon.com – you can check it out here. It’s been a few years since I read Predictably Irrational, a really interesting book that’s written by Dan Ariely. But I was living the concept today. If you’re not familiar with the book, Ariely discusses a lot of fascinating patterns that happen in our decision making processes, and what drives us as consumers. It’s forty years of hard wiring, after all. My father was very frugal and eventually, I became frugal too. Living in those post-college years meant stretching a buck as far as it could go – lots of ramen noodle soup on the menu. I was a big fan of outlet malls, floor models and clearance racks. 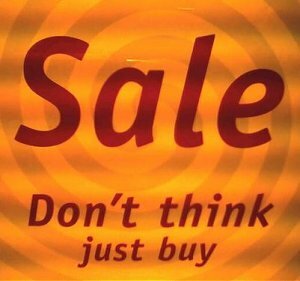 And those things can all be great – if you need the item and if it’s still a valuable item to buy. And today’s lesson? Well, we live next door to a warehouse for a major retail chain that sells bath and shower accessories. I’m all about shower gel and about product (yes, I’m trying to save the remaining 38 strands of hair on my head). But I didn’t care for their products when I’d tried them before. Yet they had a big warehouse sale today, and I kept looking out the window, fighting the urge to go over and spend money on items I was pretty sure I wouldn’t like simply because they were on SALE. I was successful at avoiding the sale, so maybe my rewiring attempts are paying off! If you haven’t checked out Predictably Irrational, it’s well worth a look. The famous “jam” study is discussed – some years back, a grocery store chain did an experiment with varieties of jam. I find this the most interesting aspect: the more choices that a consumer was given, the more reluctant they were to make ANY choice. There were far more sales of jam when there was a choice of 6 varieties than when there were 24 types to choose from. I especially find this interesting because we’re seeing more of this in stores. I don’t know whether it’s a result of this research, or whether it’s a way to manage inventory and control costs in this recession, but where you used to have six, maybe eight choices of an item, we’re seeing more twos and threes.